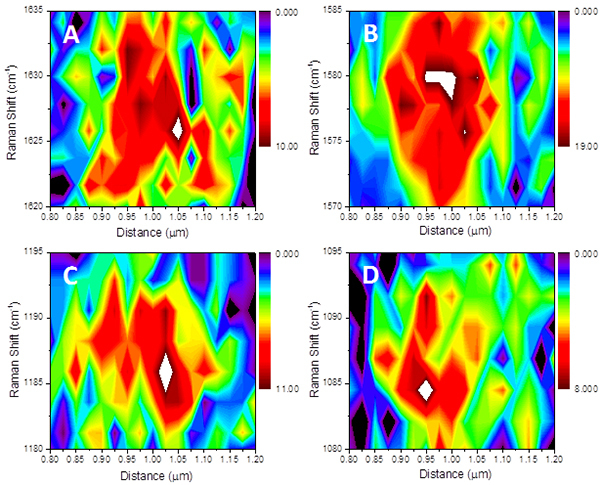 Frequency resolved TERS images of the laser-irradiated region, reconstructed using four different Raman-allowed vibrations of DMS. The representative images are obtained from the same pass of the AFM probe through the laser-illuminated region of the substrate. Namely, this is the same image, reconstructed at four different energies. The 2D contours have a color bar starting at white (brightest signals), passing through yellow to black (lowest signals). Copyright 2014: American Chemical Society. Enlarge/expand Image. Results: Light waves trapped on a metal's surface can interrogate the nearby molecules about their chemical identity through the molecule's characteristic vibrations, which act as fingerprints. Scientists at Pacific Northwest National Laboratory (PNNL) "saw" the interaction between the molecules and the trapped light waves or surface plasmons. Their fundamental endeavor could lead to breakthroughs in interpreting ultrasensitive chemical images for characterizing new materials with potential uses in catalysis and energy conversion. The article is featured in the American Chemical Society (ACS) Editors' Choice collection. The decision was made by the journal editors, who select one article a day from across the 55 ACS journals to appear in this special collection. As such, it was made freely available to the public. The article was the editors' choice for November 12, 2014. Why It Matters: To detect only a few molecules, researchers using ultrasensitive spectroscopic and microscopic techniques rely on localized surface plasmons. This is particularly the case when the molecular identity must be determined. These plasmons are essentially light waves trapped at the surface of nanoscale noble metal structures. In surface plasmon-enhanced vibrational spectroscopy, the recorded optical signals result from the interaction between molecular and plasmonic states. This was revealed by PNNL scientists, who set out to understand the information content encoded in nanoscale chemical images, recorded by taking advantage of the unique properties of localized surface plasmons. They found that each pixel in their recorded images reports on the distinct local environments in which each probed molecule resides. 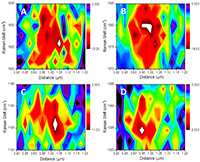 Methods: In their work, El-Khoury and his colleagues employed a gold tip of an atomic force microscope to record chemical images (25 nm spatial resolution) of a silver surface coated with 4,4'-dimercaptostilbene. They scanned the microscope's tip over a laser-illuminated area of the surface. They recorded molecular Raman scattering at every tip position. The images were then reconstructed at different energies, corresponding to different vibrational resonances of 4,4'-dimercaptostilbene. The technique is termed tip-enhanced Raman spectroscopy (TERS). Sponsors: P.Z.E. acknowledges support from the Laboratory Directed Research and Development Program through a Linus Pauling Fellowship at Pacific Northwest National Laboratory and an allocation of computing time from the National Science Foundation. W.P.H. acknowledges support from the U.S. Department of Energy, Office of Science, Office of Basic Energy Sciences, Division of Chemical Sciences, Geosciences, and Biosciences. T.W.U. and A.L.M. were supported in part by the U.S. Department of Energy, Office of Science, Office of Workforce Development for Teachers and Scientists under the Visiting Faculty Program. A surface plasmon is a collective excitation of electrons at the surface of a metal. Localized surface plasmons are confined to the surface of metal nanoparticles. These plasmons feature sizes much smaller than the wavelength of light used to excite them. Plasmons on adjacent nanostructures can interact and hybridize to form new collective modes in particle assemblies. Plasmonic materials have found use in energy conversion, catalysis, and ultrasensitive chemical and biological detection, to name a few. What makes surface plasmons so popular? They are associated with large local electric fields that can be harnessed for ultrasensitive detection and energy applications. Tweaking plasmonic properties can lead to a myriad of novel materials with diverse uses. Scientists coated a silver substrate with DMS and used a gold tip of an AFM to record tip-enhanced Raman images. The laser shining through the silver surface defines an area, approximately 250 nanometers in diameter, where chemical imaging was performed. Copyright 2014: American Chemical Society.